While checking in pick a seat towards the end of the plane. If the flight is not full, chances are most people will be scramming in the front. If you are lucky you might have the whole row, or at least the adjacent seat to yourself. And in Economy, every inch of space matters. I am a vegetarian so I always request a special meal, but even if you are not and would like to be served first just make sure you put in a request while making the reservation. That way you get to sleep longer and not get disturbed two hours into the flight. Of course you can't starve on the flight, but it is a good idea to limit the amount of food you eat. Our bodies (especially digestion system) don't function at optimum level. If you do choose to eat on the plane, keep in mind that warm foods are better than cold foods since they're easier to digest. I usually carry my own snacks, which I are rich in protein and I know will fill me up and I won't have to rely on the options available on the plane. How many mixed-trail nuts can one eat anyways, right? It is also just more convenient. Drinks lots of water. You should probably drink more water than you normally do. Air travel is extremely dehydrating. Drinking excessive amount of alcohol can lead to dehydration and grogginess. It will also aggravate jet lag which a long haul mostly results in once you land. And on an off-chance if you get sick after drinking, it will be an uncomfortable experience for everyone of the flight, yourself included. 7. 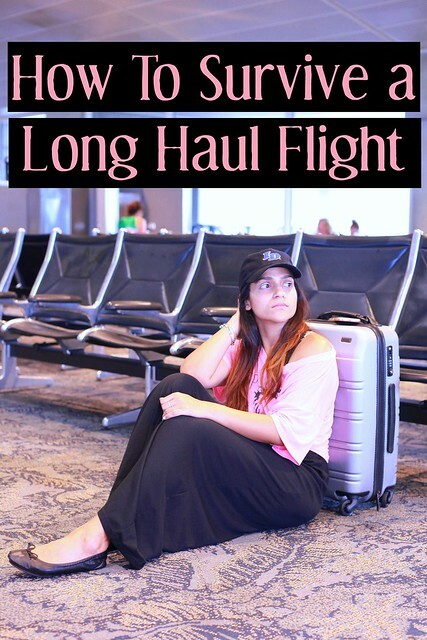 Wear comfortable, loose-fitting clothingFlights are not for making a fashion statement, contrary to all the various airport looks out there. Just be comfortable. Wear cloths in which you can move, breathe and sleep in. Scarf is your best friend while traveling. If could be an extra layer if you are too cold, and it could be an easy style element once you land. Ever since I have started traveling with one, the whole experience has changed. It helps in blocking out light helps with jet lag, and also mentally prepares you for sleep, and blocks out the early breakfast wake up on long-haul flights. You don't have to do jumping jacks in the aisle but a few neck, wrist, and ankle movements every few hours will help you with blood circulation and avoid swollen feet and ankles, leg pain, etc. Although the flight now have a power outlet and a usb port to charge your devices, but it doesn't hurt to be prepared. I carry a toothbrush/paste, comb, lotion, chapstick, and a face mist (Evian spray). Dehydration is not only within but also on the exterior of the body. While I always find enough in-flight entertainment, I always carry a book and upload a few movies/shows on my iPad for emergency. I just like being prepared. Adjust your watch to the destination's time right as you settle into your seat. It helps you to start tuning your body to the destination's time zone and make a flight plan to combat jet lag as much as possible. It is a long flight and there will be people from different walks of life, traveling for different reasons. Just be patient. Be nice. And if someone is isn't being nice back, give them benefit of doubt. Traveling is not everyone's favorite thing to do. Oh GOD. During my flight back to Australia, I sat in business class. It was glorious. They had wine tasting and I got drunk. It was HORRIBLE. I guess due to the elevated pressure and me being tired, I got hungover really quickly during the 25+ hour flight. I thought I was going to DIE. I completely learned my lesson. Staying hydrated is key for me along with having my best buddies, Mr. Noise Cancelling Headphones and Mrs. iPad!! I always try to do all of these things, except for 1 and 2, so thanks for those tips. And I always carry/wear socks because I can't sleep if my feet are cold. By the way, have you heard of Elon Musk's hyperloop? It's not yet created, but I'm totally hoping it will get done in our lifetime. This is seriously an awesome list! I always love to have a big scarf to use as a blanket! Very well written! I think the scarf is a very good idea! I recommend it too! I wasn't aware of numbers 1 and 2! I tend to gorge myself on long-haul flights because I eat out of boredom. Some people are way of pharmaceuticals, but I take half a sleeping pill and sleep like a baby for a long time. Excellent list. I'm also a big believer in setting your watch to the destination time zone as soon as you depart. It makes a huge difference in combating jet lag. I like the scarf idea -something i always forget. But definitely with plane temperature always being unpredictable, it's a must!